Top of the range lifter featuring a double direction spindle thread for fast closure and release. The handle is removable for safety of human and animal and to prevent it getting bent during use. 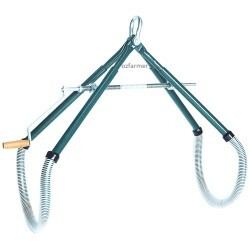 The handle can be used on either side of the lifter. All galvanised finish. Manufactured by Vink-Elst in the Netherlands. If you are buying this internationally please contact us for a shipping quote as the shipping calculator is incorrect for this item due to it being bulky and heavy. 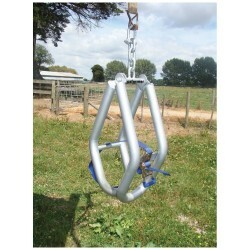 Cow Lifter for use on very large beef breeds of cattle. Made for lifts up to 2,000kg. Double-d..
A high quality lifter at a reasonable price. This model features a double-direction spindle thread t.. 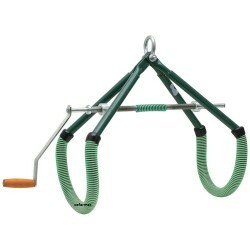 The Daisy-Lifter cow lifter is designed for medium term support for a down cow. 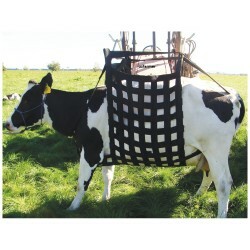 The cow is supported..
Liftease has been developed to improve usability and outcomes from existing sling-lift devices. Fir..
Quick-Lift is developed by Shoof's product development department. Its features are - simplicity of..